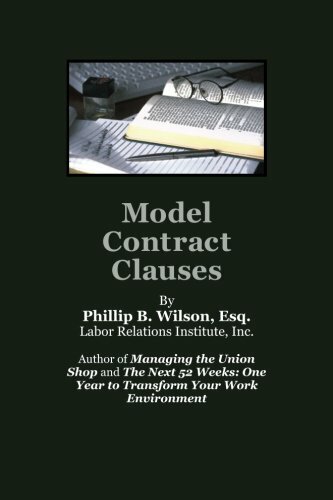 Model Contract Clauses is an easy-to-use reference manual. Each contract subject includes: an introduction to each contract subject; a "drafting guide" to each subject; a "plain English" summary of the sample clauses; actual model clauses; and pages for taking notes and drafting proposals. Most sections have between three and five sample clauses. The clauses have been selected for being representative examples of clauses you might expect to find in most labor agreements. The idea is to expose the reader to as many different types of solutions to these bargaining issues as possible.